Phenix Label has installed a new UV printing press with GEW LED UV to boost reliability and production speed. In 2016, the company equipped its 16in, 10-color Omet X4 flexo press with 10 GEW LW-1 water-cooled UV LED stations. The pressis used for self-adhesive label stock, shrink sleeves and thin film substrate conversion. Phenix Label, which also operates OMET iFLEX with 6 GEW LW1 LED stations, has retrofitted an Aquaflex Instaflex press with 8 GEW LW1 LED stations. Phenix Label Innovation vice-president Todd Fatino said that the LED UV has been selected as they provide faster run speeds, deeper curing, instant on-off, no mechanical shutters and energy savings. 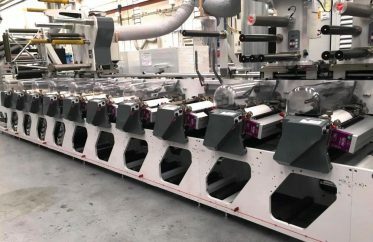 The firm now operates the printing machines which are fitted with GEW UV curing systems, GEW said. The GEW LW1 LED system allows Phenix Label to operate full hybrid UV curing on the same press and while working with both mercury arc and LED lamp technology. Based on the high efficiency LW1 LED unit, the GEW UV system is designed to offer hybrid operation capability by combining conventional UV lamps and LED UV on the same press with a single straightforward user interface. Fatino added: “Modernizing our plant and investing in high performance machinery ensures we stay competitive in the future. Phenix Label manufactures self-adhesive labels as well as labeling and packaging solutions for the food and beverage sector, and beauty and personal products, among others. Image: A GEW LED UV system at Phenix Label. Photo: courtesy of GEW.